Blood plays the important role of transporting oxygen and hormones necessary for the human body. Blood contains blood cells, such as erythrocytes, neutrophils, and lymphocytes, which are generated from hematopoietic stem cells, or hematopoietic stem cells (HSCs). HSCs possess the abilities of multipotency (the ability to differentiate into all functional blood cells) and self-renewal (the ability to give rise to HSCs without differentiation). A group of researchers led by Takafumi Yokota at Osaka University clarified that the Special AT-rich Sequence Binding Protein 1 (SATB1), a nuclear global chromatin organizer that regulates chromatin structure, played an important role in differentiation of HSCs into lymphocytic lineages. (Satoh et al., Immunity, 2013) However, they obtained these findings from experiments using genetically engineered cells and mouse fetuses, so the biological processes occurring in adults were not fully understood. In addition, it remained unclear how differentiation of lymphoid-lineage cells began. 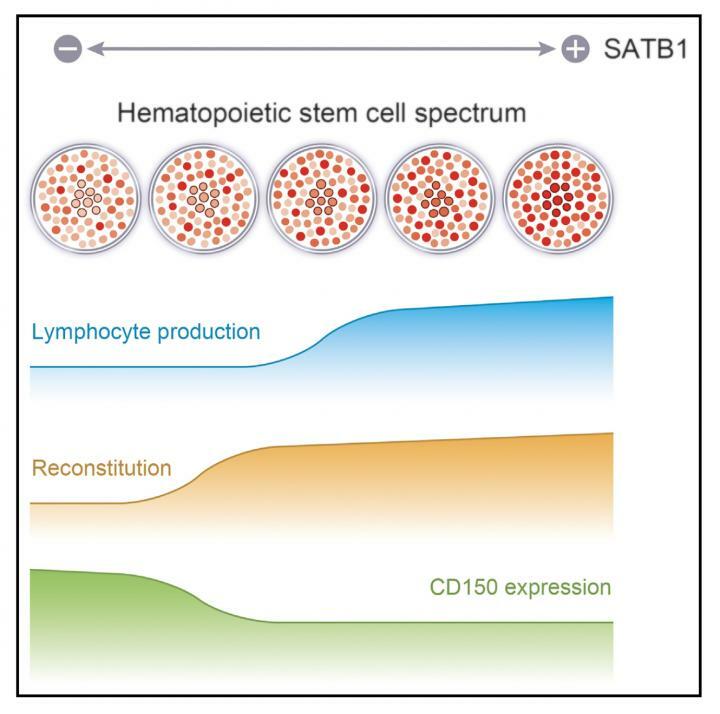 This group revealed that expression of SATB1 was involved in both differences in HSC self-renewal ability and differences in the ability of HSCs to differentiate into lymphocytic lineages. Their research results were published in Cell Reports. The researchers generated genetically modified mice in which SATB1 was deficient only in hematopoietic cells and reporter mice in which a red fluorescent protein was expressed under control of the endogenous SATB1 promoter. They examined them to confirm that SATB1 was essential for maintaining function of adult HSCs. In addition, they revealed that (1) both high SATB1 expression and low SATB1 expression were present in HSCs, (2) the volume of SATB1 expression changed during HSC self-renewal, and (3) higher SATB1 expression had greater lymphoid differentiation ability. Lead author Yukiko Doi says, "We generated genetically engineered mice to observe a phenomenon in the initial stage of differentiation of HSCs into lymphocytic lineages in adult mice." This group's achievements will deepen an understanding of the mechanism behind differentiation of HSCs into lymphocytic lineages. They will become a research base for treatment of diseases caused by immune disorders, such as infectious diseases and disorders of the hematopoietic system, through application to regenerative medicine and gene therapy.